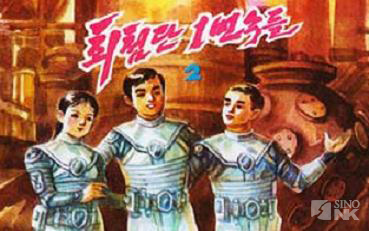 In it, Berthelier notes that while science fiction first emerged in North Korea in the mid 1950s with the translation of short stories by Soviet writers; it wasn’t really until the mid 1960s that North Korean authors, influenced not just by the Soviets but by early sci-fi writers such as H.G. Wells and Jules Verne published their own first stories (albeit infrequently), mostly in youth magazines. But that all changed in October of 1988, when Kim Jong-Il called in a speech for the “development of science fiction on a larger scale,” and writers, quite naturally, responded to his call. Authors took him at his word, telling stories of space travel and immortality and exploration – subjects and settings that pushed for the first time well beyond the borders (both geographic and artistic) of North Korea. But where on the “literary food-chain” does the North Korean sci-fi writer sit? Berthelier says that the writer Tatiana Gabroussenko has written that while North Korean writers might not enjoy the same status as their former Soviet colleagues, there are still ways for them to be recognized and praised for their achievements, such as the type of publication in which the author’s works are published. To read this fascinating piece in its entirety, click here.